Level 1 - Easy/Enjoying Bikers: Easy cycling in mostly flat areas, without uphill stretches, generally short daily bike-tours - that give you enough time to enjoy the region additionally to your biketour. Individual Tour: You decide for yourself the pace you want to cycle, the sights you want to see along the way and when to take a break. Our detailed maps and route descriptions show you the way. Bike & boat: biking only if you want, the hotel is following you! No daily packing, mostly full board, very personal/individual support. Historical towns in the land of tulips, windmills and canals. Cycling cruises: A unique and "typical Dutch" concept, where a cycling holiday and a journey on a comfortable ship are combined. Cycling cruises are ideal for those who like to cycle during the day and explore beautiful areas, without giving up a comfortable way of travelling. Explore the western part and the "Green Heart" of Holland during this exciting cycling cruise and enjoy many famous towns, interesting highlights, windmills, water and beautiful scenery. Visit famous historical towns, picturesque cities and beautiful landscapes in the surprising varied "Green Heart" of Holland by bicycle and ship. Highlights are Amsterdam with the beautiful canals, Dom-city Utrecht, harbour city Rotterdam, Delft with its famous Delftware factories, cheese city Gouda, the windmills at Kinderdijk, silver city Schoonhoven, the historical centre of Haarlem, the dunes and the North Sea beach and the open air museum "Zaanse Schans". The Southern tour is the perfect tour to explore the variety of scenery in the central part of the Netherlands with many small canals and lakes, and also the beautiful old cities during daytime and in the evening. You will live and travel on board of the DE AMSTERDAM. Flat, asphalted bike paths and side roads, ideal for children. If you don’t want to cycle, you can stay on the boat. Individual arrival to Amsterdam. Embarkation from 2 p.m. on. Explore downtown Amsterdam: time for shopping, to visit a museum or to do a canal tour (reduced tickets available on board, until 10 p.m.): this is an unique way to see the capital of Holland from another side. First night on board in Amsterdam. At breakfast, cruise to Breukelen and first bike tour along the beautiful winding river Vecht. Along this river you will see very nice villas, cottages and small castles. You will follow the river into the centre of Utrecht with its Dom (Cathedral) tower, 111 m. high. In the afternoon: continue by ship from Utrecht to Rotterdam. Cycling tour via "jenever-city" Schiedam and through the Delfland area to Delft. Visit the beautiful city centre with its small canals, picturesque streets, bridges and alleys. For many guests a visit to the Delftware factories of "Royal Delft" is one of the highlights of the tour. Dinner cruise from Rotterdam to Dordrecht. Arrival around 8 p.m. In the evening short city walk (free). Today you can cycle the first part or the “waterbus” will take you and your bicycle to Alblasserdam. After just a few minutes of cycling you will reach Kinderdijk (UNESCO cultural heritage, with its impressive row of 19 large windmills). You then have the choice between a longer bike tour with a visit to the beautiful cheese city of Gouda and a short bike tour through the Alblasserwaard. Both tours end in the “silver city” of Schoonhoven, where you can visit a silversmith. Cycle tour from Schoonhoven through the beautiful “Green Heart” of Holland via Oudewater (visit the Witches Weigh House) to Utrecht. Near Oudewater you can visit a traditional cheese farm, where you can also buy delicious farm-made Gouda cheese. In the late afternoon, the ship will bring you from Utrecht to Haarlem. From Zaandam your final day of cycling will take you to the open-air museum the Zaanse Schans (free entry), with its beautiful windmills, an Old Dutch village with traditional wooden houses, a cheese farm and a traditional wooden clog maker. After exploring the museum you cycle through the recreational area “Twiske” back to Amsterdam. The afternoon and evening are yours to enjoy everything Amsterdam has to offer. If you didn’t go for a canal tour on the first day, you will have the opportunity to do so today. Disembarkation after breakfast. Individual departure. Due to changing wind and weather conditions as well as organizational requirements we reserve the right to make changes of routing and program. continue by train directly to Amsterdam Centraal - duration approx. 20 min. - Price approx. € 5.
continue by bus line 48 to the ship landing stage - duration approx. 15 min. - Price approx. € 2,90. Parking in Amsterdam is only possible on official parking areas or in garages. Parking in the city center of Amsterdam costs approx. € 5,- per hour. In the city center are numerous parking areas (Parkhouses/Garages) of which some are connected with a park guidance system. The blue-white signs of this guidance system will lead you to the next parking where places are still available. Parking on yellow curbs is forbidden. Attention: Wheel clamps may be used. Penalties for parking violation are very high. Pick up and bringing service of your car from and to the ship landing station in Amsterdam. You can find the registration form in your travel documents. After depositing your luggage at the ship you will park your car yourself. Travel time to the garage: approx. 10-15 minutes. Shuttleservice to ship and return. A monitored parking directly at the main station (only for cars up to 2,10 m height). The discount price (as per 2014) is approx. € 12 for 24 hours. approx. € 90-100 / week. Further information about Amsterdam and and also more parking possibilities you can find here www.iamsterdam.com/en-GB/ under "Plan your trip" / "Getting here & around" / "Parking". Please plan your journey accordingly to be on time for embarkation between 2 p.m. and 5 p.m. Thank you for your understanding, that it is not possible to go on board before embarkation started. daily coffee and tea until 4 p.m. If you would verifiably receive better conditions and/or prices from another tour operator at the time of booking we guarantee at least the same conditions PLUS 1 handlebar bag for FREE! Welcome on Board DE AMSTERDAM! 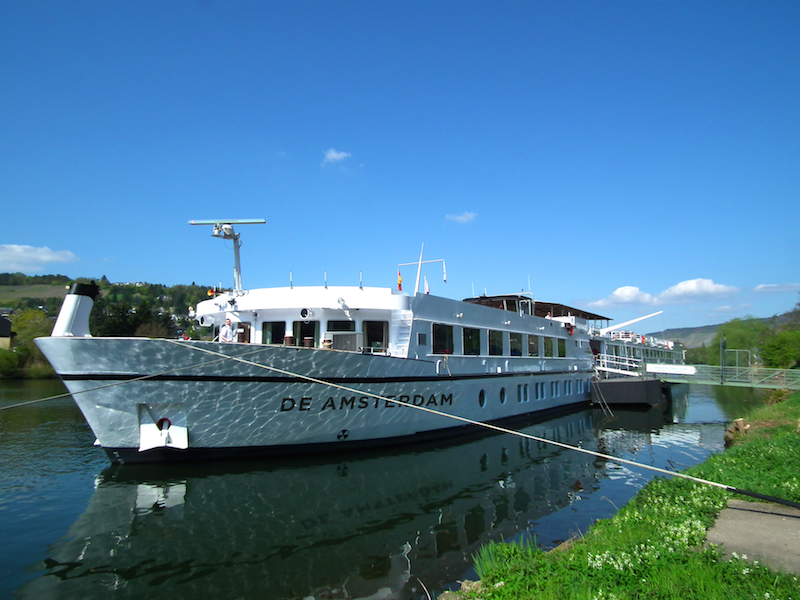 DE AMSTERDAM is a 311 ft. long and 36 ft. wide, very well equipped river cruise ship. The vessel has 56 staterooms for max. 112 passengers. All staterooms are outside cabins. The lower deck has 10 twin cabins and 20 superior twin cabins (approx. 135 sq.ft.). All cabins have an individual climate control system, digital TV, roomy wardrobe, mini-safe, hair dryer, 230V and 115V sockets, 2 separate single beds (78 x 31 inches) and a private bathroom with shower, toilet, basin and bath products. All twin cabins have a large picture window (4.59 ft. x 2.95 ft.) that can be partly opened. The difference between twin and superior twin cabins on the lower deck is their location in relation to the engine room, stairs and salon. The upper deck offers 18 identical superior twin cabins and 8 spacious French Balcony Suites. The Suites (approx. 200 sq. ft.) have the same amenities as the superior twin cabins, but are larger and – in addition – also have a mini-bar and a “French Balcony” (floor-to-ceiling sliding glass doors) instead of a window. The beds in all suites are set as a hotel-style bed (78 x 62 inches) and can, optional (on request), be set as two separate single beds (78 x 31 inches). DE AMSTERDAM has a restaurant on the lower deck. You can enjoy the scenery in the cozy lounge / bar with dance floor and large panoramic windows on the upper deck. In the bar/lounge, Wi-Fi is available for guests (complimentary limited data packages included / additional data packages can be purchased online). On the partially roofed sun deck, chairs and sun loungers invite for a stay. Bicycles will be stored on a separate part of the sun deck. On board of this comfortable ship are in total 56cabins (approx. 11-15m²) with en-suite shower + toilet, all with single low beds (double in the suite but can be used as twins) and individually adjustable air-conditioning. There are some single and triple cabins. The interior of the ship is a no-smoking area: smoking is only allowed on the (outside) sun deck. Available on board (50 MB per day/person). If you need more data volume please contact the crew. Please remember that during your bike and barge tour the internet connection may be unstable sometimes. 7-speed-hub circuit with hand pedal brake, as well as paniers. On some barges we offer modern quality-electrically assisted bikes (Pedelecs) with 7 or 8-gear-hub circuit, gradual selectable help of pedaling power and deep UNISEX-comfot-entrance. The bikes are equipped with a powerful Panasonic or Bosch-Pedelec-Engine and a powerful Lithium-Ion-Battery, one battery-charge is sufficient for up to 65 kilometers. The range of the battery is depending on supportlevel, riding manners, body weight and terrain. In a more hilly terrain or with a higher bodyweight there is more batterycapacity used then in flat areas or with a low bodyweight. You can save battery, when you start with most possible low support and increase only if needed. The batteries are supposed to be charged overnight with the provided battery charger. IMPORTANT: book early, because of limited capacity! can happen, also when bikes are well serviced and maintained. Flats can be fixed by yourself. If there’s a difficult repair you may call the local representative. Please don’t get any repairs done on the bike without informing the tour operator/local representative and their approval. If you bring your own bicycle, please pay attention to the following aspects: You are personally responsible for your own bike on board and ashore. Protect your bike against theft on board, as well as on land with a lock. The bikes will be brought on board and from board by the crew. Due to the local conditions we cannot prevent scratches and damages on the bikes. Please understand that we cannot accept any liability. The bikes on board are exposed to weather conditions because the parking is not covered. Please bring along your own spare material and repair kit for your bike. In the Netherlands it is not mandatory to wear a helmet. Book early, those bike & boat trips fill up fast!